The buzz is true; the under-the-radar cult gem Miracle Mile is surprisingly great. Harry (Anthony Edwards) and Julie’s (Mare Winningham) hellacious night on Los Angeles’ titular Miracle Mile suggests Before Sunrise crossed with Children of Men crossed with After Hours, but without the reprieve of a hopeful ending. Unless you consider life on a geologic scale, in which everything we are becomes oil and diamonds. 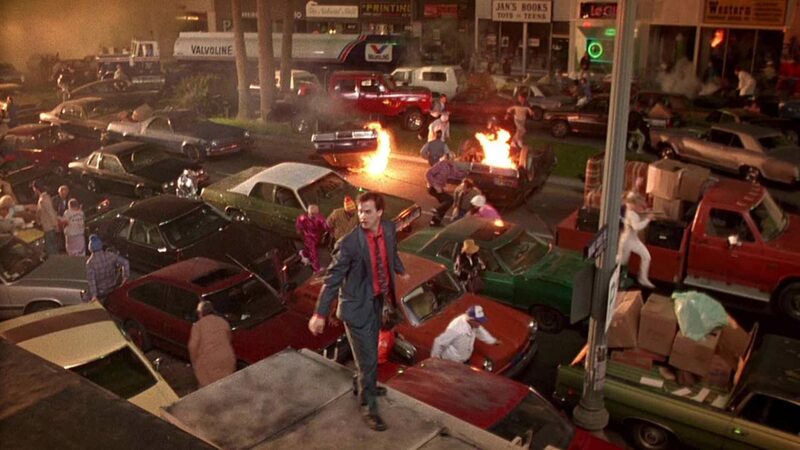 Director Steve de Jarnatt’s Miracle Mile is simultaneously an emotionally affecting love story and a gripping thriller, but its most extraordinary achievement is its patience to allow grand events to slowly unfold, from the personal (boy accidentally sleeps through date with girl) to the cataclysmic (the literal end of the world). The frenzied breakdown of society over little more than a rumor seems inevitable when everyone has spent a lifetime under the chronic anxiety of nuclear meltdown and/or war — all the while externally carrying on with everyday small business: playing trombone in the park, catcalling in diners, stealing stereos, cheating on diets, and flirting in museums. The best anyone can hope for is to have someone to embrace at the end. Miracle Mile: A Romance for the Doom-Burdened by Andrew Todd for Birth Movies Death, encouraged me to check this incredible movie out.